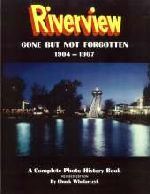 Riverview is gone, but not forgotten. In the spring of 1967 it opened for what was to be its last season. It closed its gates, as always, on Labor Day evening, supposedly to open again in May, 1968, for its 65th season. In fact, the license had been purchased that fall for the 65th season and also the new sign had been painted and put up showing the opening date in 1968. No one knows for sure why the park closed. Some feel that racial problems closed the park, some say that the stockholders were offered a good deal and didn't want to pass it up. Whatever the reason, Riverview was sold to the dismay and sadness of millions. The park was sold for approximately $6.5 million on October 3, 1967, and never reopened. Interestingly enough today that $6.5 million could not even rebuild the Bobs roller coaster. ©2000-2005 Joyland Books. All Rights Reserved.